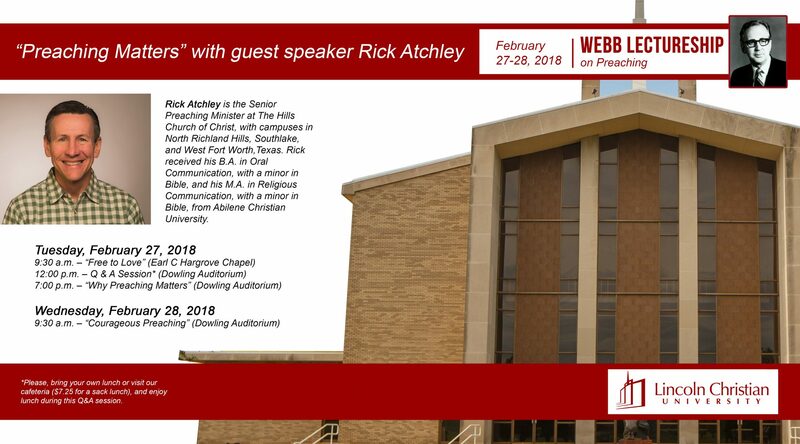 Rick Atchley is the Senior Preaching Minister at The Hills Church of Christ, with campuses in North Richland Hills, Southlake, and West Fort Worth, Texas. Rick received his B.A. in Oral Communication, with a minor in Bible, and his M.A. in Religious Communication, with a minor in Bible, from Abilene Christian University. *Please, bring your own lunch or visit our cafeteria ($7.25 for a sack lunch), and enjoy lunch during this Q&A Session.